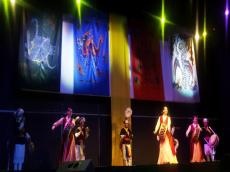 A large-scale concert dedicated to the 25th anniversary of establishment of diplomatic relations between Azerbaijan and South Korea has been held in Baku. Colorful show took place in Elektra Event Hall on November 5. The concert titled "Breath of Korea" was co-organized by Korean Embassy in Azerbaijan and SEBA (Seoul-Baku) Azerbaijan-Korean Cultural Exchange Association. Representatives of diplomatic missions and mass media, public figures and all lovers of ancient Korean art attended the event. The floor was given to Ambassador of the Republic of Korea to Azerbaijan, Kim Chang-gyu, who welcomed the guests of the event, stressing that musicians will add color to autumn night in Baku. Korean traditional dances and music were demonstrated to the public by Samul Qvanq De group. At the beginning of the concert, artists appeared on a stage as street musicians. The gala concert was followed by the performance of Binari, religious singing and shaman ceremony. Besides, fascinating dance by beautiful girls with pink flowers in their hands left no one indifferent. The performance of Azerbaijani national anthem and national folk song " Yellow bride" on Korean musical instruments was beyond all praise. At the end of the concert, guests joined the dance with artists. Magical evening in a wonderful and happy atmosphere delighted the audience with variety of dance numbers and folk music. This year Azerbaijan and the Republic of Korea mark 25 years since the establishment of diplomatic relations. Despite the geographic distance, two nations enjoy a warm relationship. The two countries have steadily developed relations in various fields, including politics, economy, and culture.